NOTE:This item is for regular 3ds only. Does not work for XL. 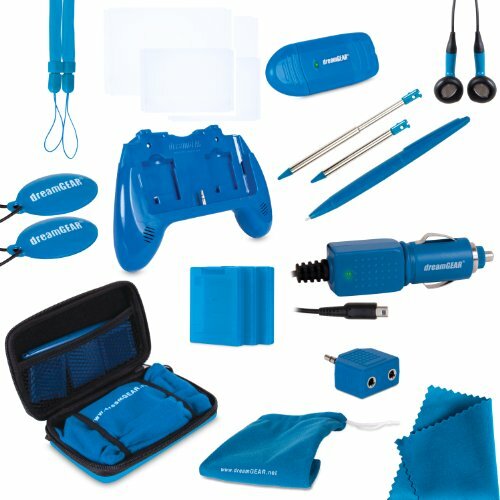 The dreamGEAR 20-in-1 Essentials Kit for Nintendo 3DS contains all you need to dramatically enhance your 3DS experience. Included is the Play It Loud attachment which features dual stereo speakers for improved audio and also offers added comfort and grip for your 3DS. The Play It Loud requires (2) AAA batteries to operate (not included). Further included is a protective carrying case, a large stylus, (2) small precision styluses, ear buds, (3) game cases, (2) wrist straps, (2) screen cleaners, (2) screen protectors, a car charger, an audio splitter, a USB SD card reader, a microfiber cleaning cloth and finally a tote bag to carry it all. Find all you need for your 3DS in one box for one great price with the dreamGEAR 20-in-1 Essentials Kit! Fits original 3DS model CTR-001 (not compatible with new 3DS Animal Crossing model KTR-001).